One of the historical figures I hold in most high regard is Abraham Lincoln. One of the things I admire most about him is that even when fighting for the righteous causes of preserving the Union and ending slavery, he would not claim God was on his side. In Behold a Pale Horse, Captain Viñolas (played by Anthony Quinn), a police captain in Franco's Spain, has no such humility. The film is set in 1959, two decades after the Spanish Civil War, and the captain believes that because Franco won, Franco is God's man. 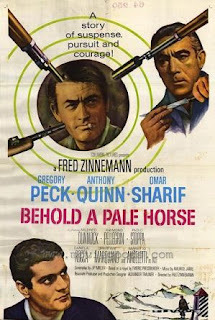 A rebel named Manuel Artiquez (played by Gregory Peck), is still fighting the war. Artiquez lives in France but slips into Spain for raids and robberies. We see the Captain enter a Catholic church. He lights a candle and prays before a crucifix. "He's your enemy too," the Captain says to God. "I wouldn't ask you this, but he's killed my men. Let me have this victory, God." To insure God's assistance, the Captain even promises to return a horse he's stolen. The rebels, for the most part, don't claim to have God on their side. Most of them, including Artiquez and his mother, are communists and want nothing to do with the church. One of Artiquez's men warns a young child not to trust in churches or priests or crosses, promising they will all disappoint. When Manuel Artiquiz's mother becomes ill, the Captain sees an opportunity. He hopes the rebel will risk coming to Spain to see his mother in the hospital. If he does, he can be captured. A priest, Father Francisco, comes to see the woman. The priest, played by Omar Sharif (of Lawrence of Arabia), asks the woman about her health. She tells him she's dying. "The Lord giveth and taketh," the priest tells her. The priest asks what he can do. The woman says he can bless the guns of the firing squad that will be used on her son. The woman asks whether God would hear the request of a heathen. The priest answers that God hears all His children. The woman says she doesn't want sacraments, she wants her son saved. Father Francisco says he'll do what he can. The Captain approaches Father Francisco after his visit with the mother and asks for information about Artiquez. He reminds the priest that the rebels desecrated the church. "We mustn't forget the clergy and the Guardia Civil are on the same side, both trying to serve our country; you by prayers and me by enforcing the law." Father Francisco is leaving with other priests of his monastery for a field trip to Lourdes in France. They particularly hope for healing for Father Estaban. Estaban was injured when rebels robbed a bank where he happened to be. Since then, he’s been a little mad. Artiquez was one of those bank robbers. Father Francisco leaves the group during the trip. He goes to see Artiquez in order to warn him that the Spanish police plan to kill him if he tries to see his mother. Artiquez mocks Father Francisco for his belief in God asking why he became a priest. The priest tells him that during the war, his father was killed. He doesn’t know which side, the rebels or the government, killed him. So he decided to serve neither side and both sides by serving God. 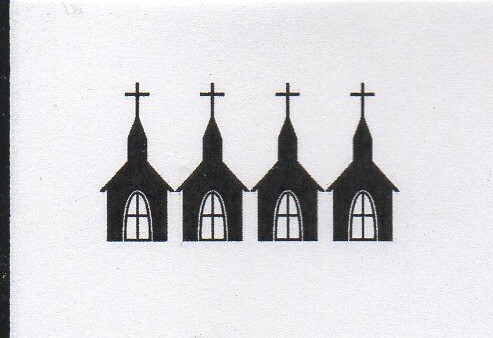 A Lincolnesque attitude, and the reason I’m giving Father Francisco and his church 4 Steeples. Police and Priest: Why Can't They Be Friends?